I did. As I do….every few weeks…since the pool was installed. The choice between chlorinated and salt water pools has always been debatable with pros and cons for both, but what if a chemical free swimming pool was an option? What is the difference between chlorinated and salt water pools? Not much really! Whilst there is the perception that salt water pools are a natural alternative to chlorinated pools, salt water pools do in fact still contain hazardous chorine. The levels of chlorine are lower than and not as concentrated as they are in a chlorinated pool but a salt water pool is not chlorine free as some are lead to believe. Salt water pools run through a process of electrolysis to convert the salt to chlorine. 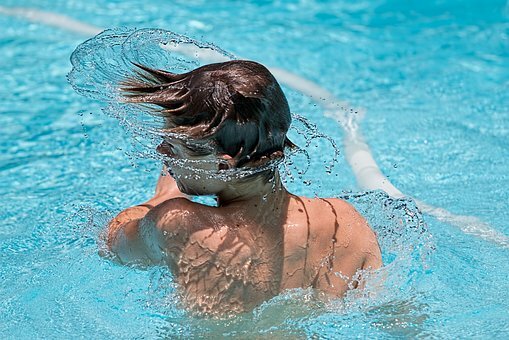 Irritable eyes and itchy skin are common discomforts in reaction to pool chemicals. For some, allergies and respiratory issues can be an even more dangerous consequence. Chlorine is hazardous to handle and to store and we all know that strong chlorine smell! Chlorine is used to kill harmful bacteria and organisms found in the water, but there is a more natural alternative. Vitel Swimming Pool Floats allows you to convert your swimming pool or spa to freshwater. Eliminating all the chemicals and nasties we just don’t need. The Vitel Swimming Pool Float contains the highest quality magnesium Vitel water beads which assist with converting the bond between hydrogen and oxygen atoms into smaller water molecules. Water becomes super hydrating to the body’s cells and any living cells. The magnesium beads stabilize the pH of your pool. No bacteria. No Germs. No Fungi. Chemically Free. To find out more visit https://www.vitelwater.com.au/products/swimming-pool-canister/ and convert your swimming pool today!